THE lawmaker representing Osun West Senatorial District, Senator Ademola Adeleke, has declared his interest to contest the September 22 governorship election in Osun State. Adeleke made this known in a letter he addressed to the Peoples Democratic Party, PDP. Adeleke, who has spent barely a year in the Senate, replaced Isiaka, his elder brother, who died in April 2017. The letter reads: “In accordance with the directive of the leadership of our great party, I wish to respectfully express my intent to vie for the ticket of the party as its candidate in the Osun State governorship election holding on the 22nd September 2018. “I am a member of the party in Sagba Abogunde Ward 2 of the Ede North local government in the Osun West senatorial district. “As a loyal man from the strongest political base of the PDP in Osun State, I am willing, able and prepared to offer myself for this great service if given the opportunity to fly our flag as the governorship candidate. 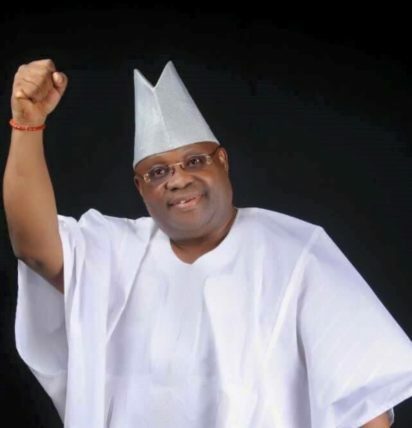 The post Osun gov poll : Adeleke writes PDP, declares governorship ambition appeared first on Vanguard News.